In 2014 I began a Happiness Jar. The idea is to jot down a highlight of your day on a scrap of paper and put it into a jar each day, then read all the notes on New Year’s Eve. My jar was full five months into 2014, and being a stickler for rules, I refused to do anything about it because it wasn’t New Year’s yet. By the time 2014 came to an end, I was in no mood to explore my own happiness. So, please make use of a Happiness Jar but don’t get caught up in any rules around it. 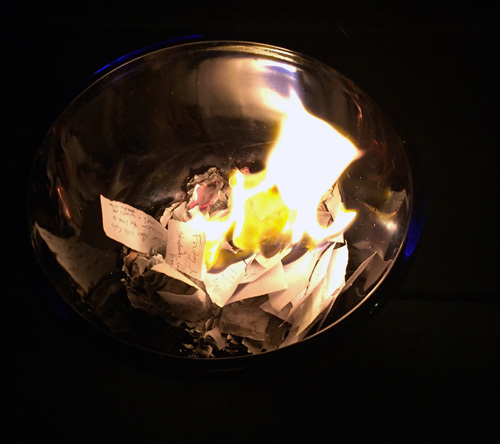 I like bringing fire into any ritual I do, so after I read my notes I burned them all on New Year’s Day. This is optional and should only be done if you can do it safely! Burning down your home is NOT something you’ll want to add into a note for your next jar. You can add whatever extra steps you would like to your own Happiness Jar, or Happiness Fish Tank! Make a family jar, add to it weekly, read them back monthly, quarterly, whenever you need a lift, or turn it into a time capsule and don’t read them for years as I did. I heard of this from author Elizabeth Gilbert. Every night write down the happiest moment of your day on a scrap of paper and save it in a jar. -any memory you want to save. It takes just a few seconds each day to do this. Then on New Year’s Eve (or whenever you feel like it!) open your jar and read each item. Be prepared to be blown away. Leave a comment for: "Happiness Jar"